Since the DVX100 has more user-controllable options than most "prosumer"DV cameras it can be confusing what each control does. 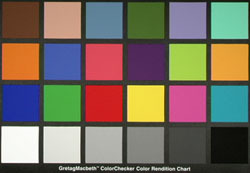 I took several images of the GretagMacbeth ColorChecker (tm) chart under the same lighting conditions and exposure, but with different settings of the gamma and matrix menu selections. Before shooting I did a manual white balance on a white sheet of paper; other camera settings as noted at the bottom of the page. The images are 1:1 crops from DV frames with no processing, so they are based on the normal DV (ITU-R BT.601) brightness range of 16-235 and appear more washed-out on computer displays (where the full range of 0-255 is more normal). The image below is a composite of three separate frame captures. In Photoshop I cut-and-pasted sections of each of the six columns of colors in the chart, with the gamma menu setting as labelled at the top of the column. Relative to the "normal" gamma setting you can see that the "low" gamma setting makes the midrange grays darker, and high gamma makes the dark tones lighter. The only change between images was the menu: lighting and exposure was fixed. 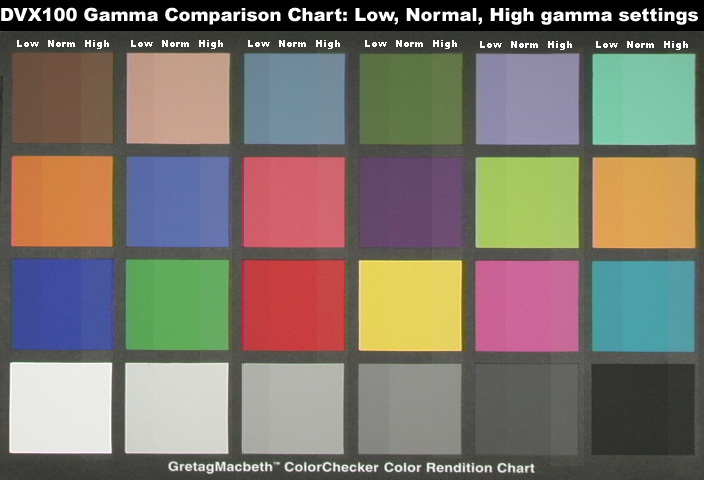 For the gamma comparisons I used "normal" color matrix. In the image below I compare the "normal" gamma setting with the "cine-like" setting, again using the same exposure for each. You can see that the white level is nearly the same, but the midtones are all darker in the "cine-like" image, except for the darkest level (lower right box) where the cine-like image is lighter. Note that there is a hint of yellow in the cine version of the white box (lower left). 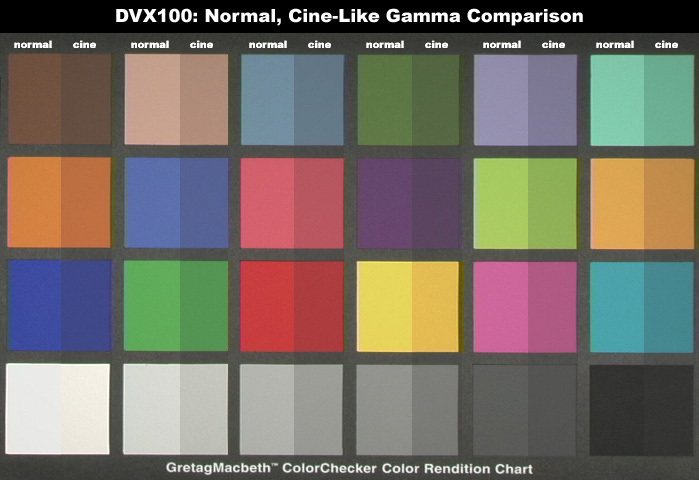 I believe my white-balance paper was slightly more blue than the Macbeth white reference, and the DVX with cine gamma is not saturating at this level so it presents a truer color. The normal gamma curve compresses peak R,G,B levels and pushes all very bright colors towards neutral white. It appears that the cine-like setting preserves more image information, if your scene does not have hard-clipped white levels. In the matrix settings, the "fluorescent" setting appears to mostly affect the red and yellow colors making them more saturated relative to the normal setting. 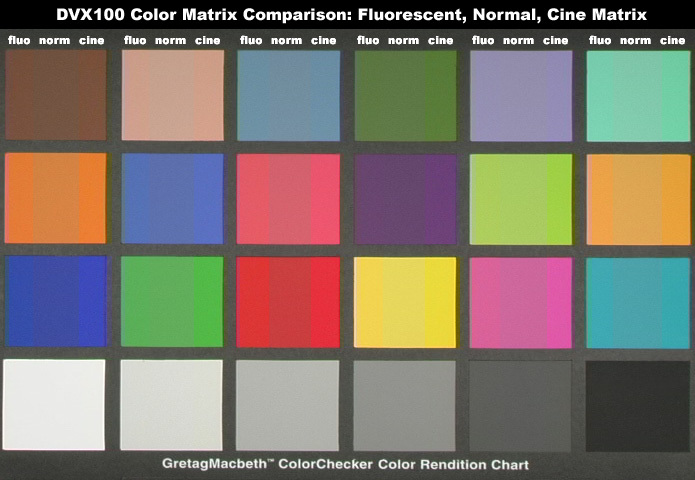 The "cine-like" matrix makes all the colors more saturated. Note that the neutral gray tones remain unchanged by different matrix settings. Exposure was the same as in the above gamma test. For this matrix comparison I used "normal" gamma. Camera settings for all tests: Gamma (as indicated), Matrix (as indicated), Detail -4, Chroma Level 0, Chroma Phase 0, Color 0, Master Ped -5, Iris -3, Skin Tone Dtl Off, Detail Thin, 24P normal. Manual exposure 1/48 sec, f/8.0, 0 dB, no N/D filter. Manual white balance on white paper. Lighting: two 60 W halogen floods (one on each side) at 18". I manually set exposure (f/8) to just barely not clip on the white square. A spotmeter on a grey card (set for ASA 400) also indicated f/8. I locked off the exposure at f/8 and used this setting for all the gamma and matrix shots.